Sizing between the Dolores tops in our collection may differ in material and sizing. 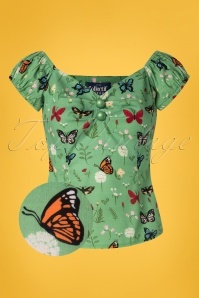 Please consult above sizing table to determine sizing of this top. TIP; If you are in between sizes, choose the bigger one if you do not like your waist to be emphasized, or the smaller one if you like a tigh fit. The bust sizing is very forgiving because of the pleats. Sleeves can be tight if you have a fuller upperarm. 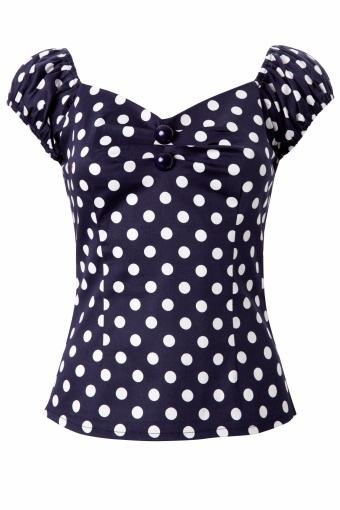 Another Classic from Collectif: The Dolores Carmen top Polka Navy White. Olá Signora! Gypsy style top with gathers around the neck and cute puff sleeves. Can be worn off shoulder. It is fitted through the waist. Finished of with a couple of fake buttons at the bust. 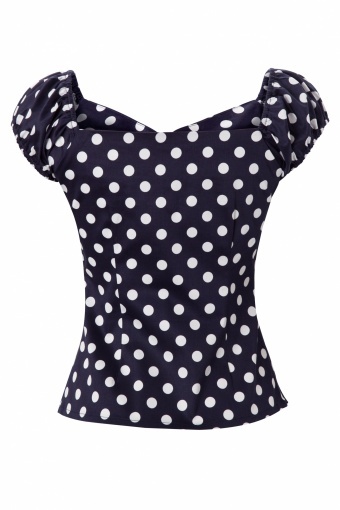 Made of a light cotton Poplin in a playful black white polka dot print. Side zipper, this basic is a must have! Available in different dessins and colours! Dit topje past mij perfect en draag het met veel plezier met jeans of een kokerrok. Wat een superkleding, ben er zo blij mee! En manlief knikte ook nog eens goedkeurend! Hier kom ik snel weer terug!